until ingredients are thoroughly combined. until oil has been emulsified. Fill the cups of a lightly oiled 12-muffin tin with the batter. You should have enough batter to fill each cup all the way to the top. Bake at 350 degrees Fahrenheit for 28-30 minutes. 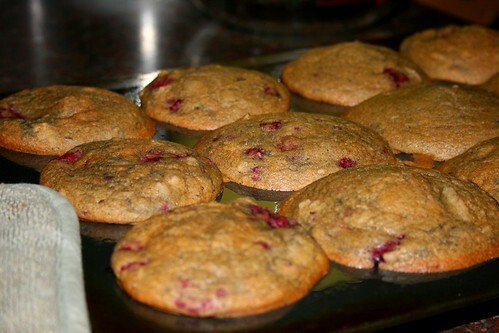 Allow muffins to cool for 10-15 minutes before removing from tin. Verdict: I loved these. I like that they were sweetened with maple syrup, which is a bit more understated than cane sugar. I think I could have added more raspberries, or, if I were really nuts, I could have thrown in some chocolate chips for a dessert muffin. 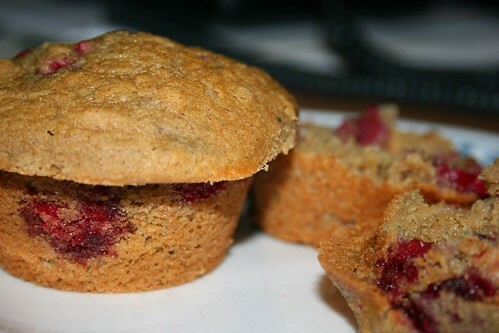 Hi I am currently making these and I added 6oz of fresh raspberries I even chopped them in half and they have been in for about an hour now and they are still raw in the middle. Any suggestions?